At King's ECO Plastics we take the responsibility of assessing and managing our environmental footprint very seriously. We are highly committed to sustainability in manufacturing and care for our environment, and therefore take great care of investing in plastic injection molding technologies and processes to minimize energy and resource consumption and waste. In fact, our corporate commitment to sustainability is supported by a multidimensional, integrated approach that extends across all areas of our business and operations. **Recycling involves processing used materials into new products to prevent waste of potentially useful materials, reduce the consumption of fresh raw materials, reduce energy usage, reduce air pollution (from incineration) and water pollution (from landfilling) by reducing the need for "conventional" waste disposal, and lower greenhouse gas emissions as compared to virgin production. 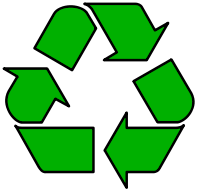 Recycling is a key component of modern waste reduction and is the third component of the "Reduce, Reuse, Recycle" waste hierarchy.